The Drought Information Statement is a summary of the current state of the drought, including precipitation deficits, local impacts, outlooks, and other information. 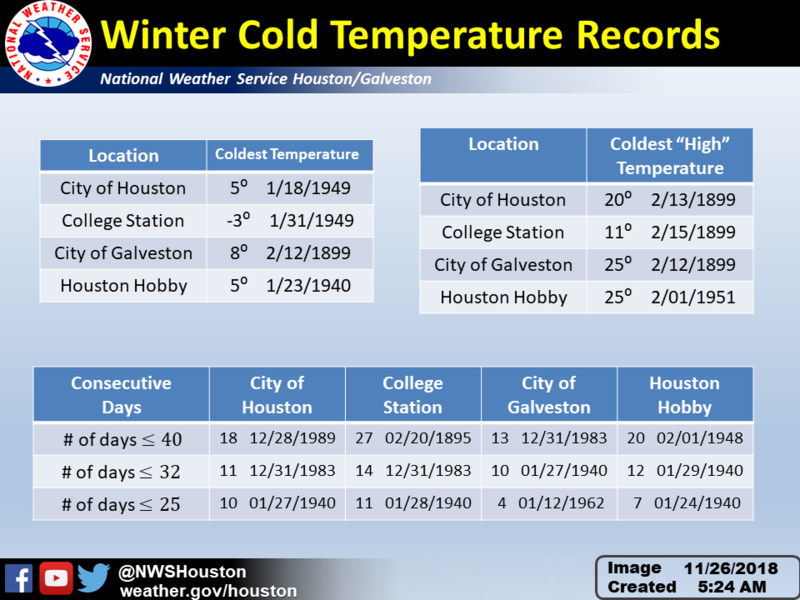 A statement is issued when severe drought (D2) is occurring within the NWS Houston/Galveston area of responsibility. 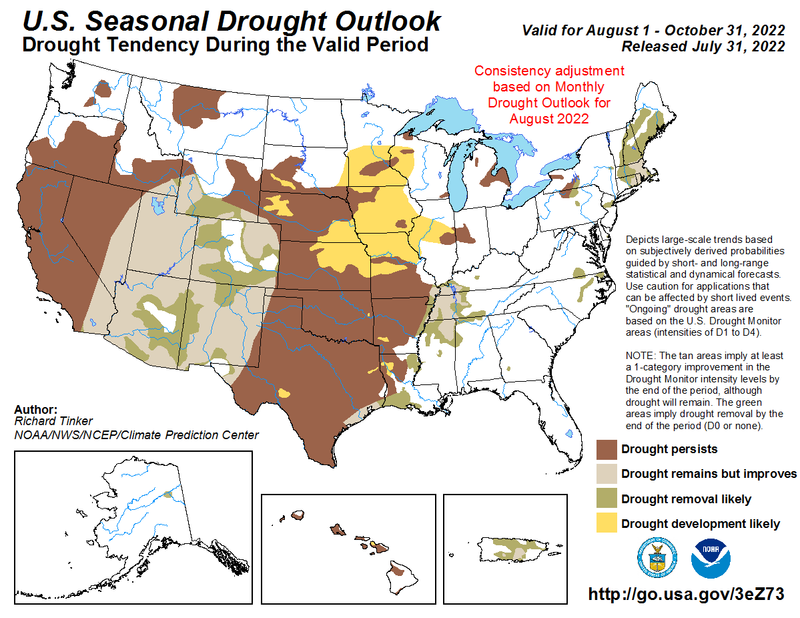 The U.S. Drought Monitor was established to assess drought severity in a subjective but uniform manner. Since 1999, various agencies, including those within the U.S. Department of Agriculture (USDA) and the National Oceanic and Atmospheric Administration (NOAA), have pooled their expertise with that of academia and local interests to more accurately categorize drought. Incorporating the input of all these entities, the National Drought Mitigation Center (NDMC) issues a weekly assessment of drought severity on a national scale. 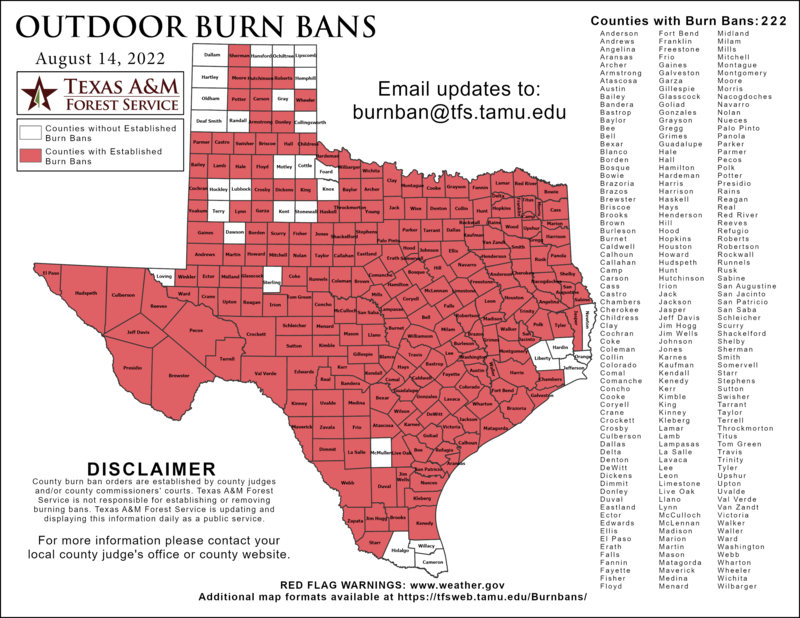 Click the image below to enlarge, or click here for a closer look at Texas. 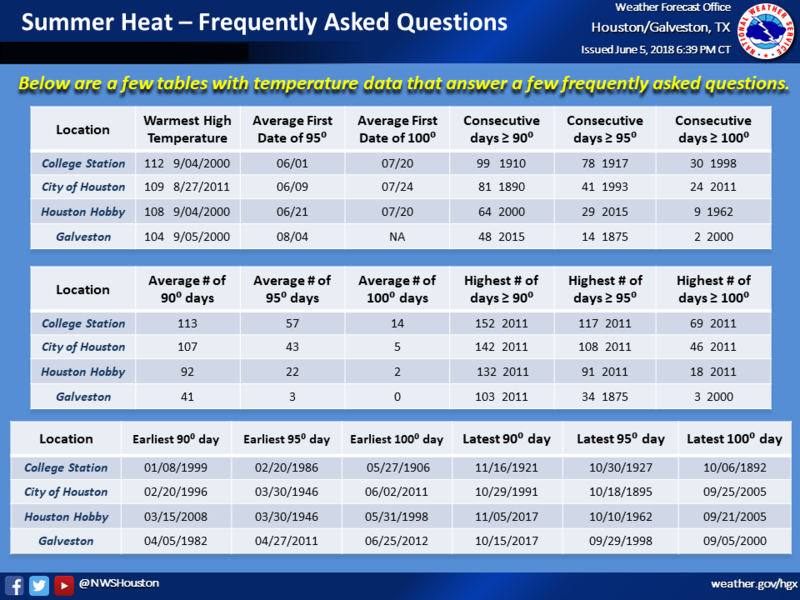 The Palmer Drought Severity Index measures primarily meteorological drought (precipitation versus normal). Click here for an image. 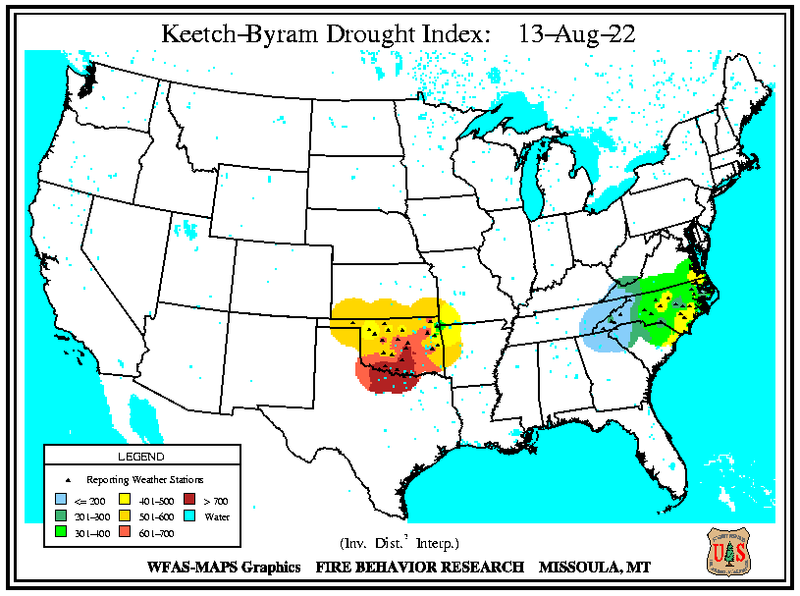 The Keetch-Byram Drought Index is a drought statistic specifically designed to assess fire danger. Click on the image to zoom in on Texas, or click here to enlarge the national map. The USGS keep track of the latest stream flows at river guages for area rivers, streams and bayous. Generally, below normal stream flows can be expected during drought conditions. 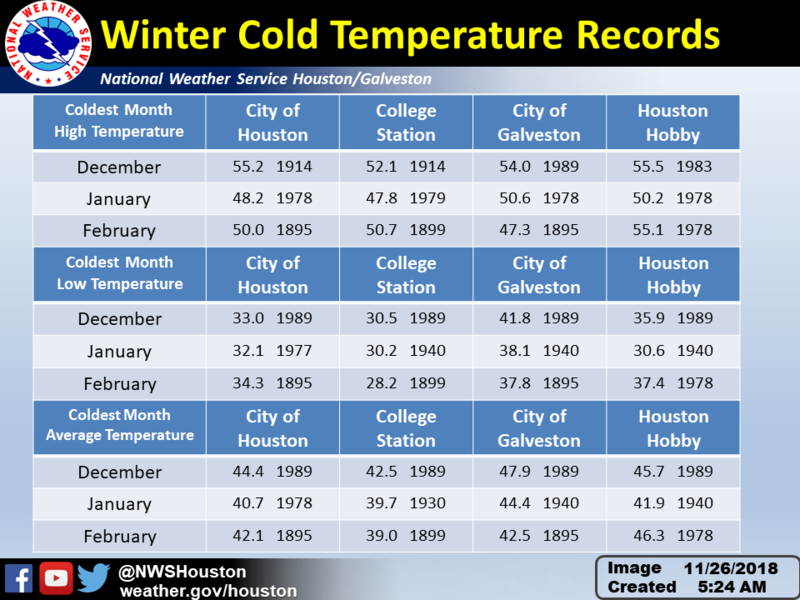 The daily Hydrologic Summary contains a list of river and reservoir levels. Toward the bottom of the product, the current lake levels are listed alongside their normal (conservation) pool levels. The difference between the two is the current deficit/surplus for a reservoir. Drought severity is inherently linked to the impacts of the drought. Such impacts include agricultural issues, hydrologic deficits, increased fire danger, and other economic and social consequences. These impacts are not easily quantified with simple statistics. 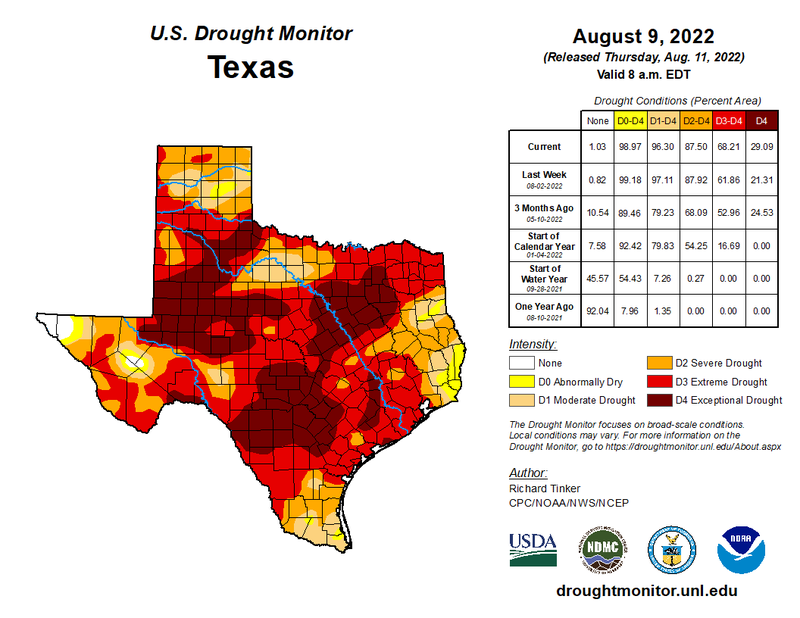 This site has updated information on any ongoing drought across Texas. Users can also load maps of drought indices such as the Standardized Precipitation Index (SPI) and look at percent of normal precipitation. Information on the impacts of the drought and other press releases can be found on the site. What Can We Expect the Next Several Months? CPC's 3-month outlooks present the likelihood of receiving a precipitation total that differs significantly from normal. For precipitation, green areas denote parts of the country with an increased chance of being in the wettest tercile, or the wettest third of historical data. Similarly, brown areas denote parts of the country that are projected to have an elevated chance of being in the driest tercile. Where neither color is shaded, CPC has concluded that there is no strong signal to determine an accentuated chance of being in either the driest or wettest tercile. This does not mean that near normal precipitation is expected, but simply that the 3-month period is just as likely to be in the wettest tercile as it is to be in the driest tercile.